When integrated into the total supply chain management solution, the SmartStick™ addresses a critical missing link for providing reliable tracking of unit-load platforms throughout the transportation, distribution and inventory network. Capable of carrying virtually any RFID tracking or monitoring device, the SmartStick™ meets key retailer, Fortune 500 and Department of Defense RFID compliance requirements while reducing product losses and improving supply chain efficiencies. The SmartStick™ is a new and revolutionary technology for mounting Radio Frequency Identification (RFID) tags onto wooden and plastic pallets. Made from high-impact and UV resistant resin, the SmartStick™ provides a quick, inexpensive, reliable, and permanent method of mounting electronic sensors and RFID tags within the deck-plane of the pallet. Mounted securely to two or more stringers or blocks between existing deckboards, the SmartStick™ is protected from forklift-tine or load damage and provides direct line-of-sight readability to RFID interrogators. SmartStick™ alone The SmartStick™ helps address information needs across the entire supply chain by integrating the RFID tag into the unit load pallet. The SmartStick™ manufacturing process accommodates virtually any customer specified RFID tag. Once manufactured to customer specifications, the SmartStick™ is attached to conventional wood or plastic pallets. These integrated tags are then programmed with data relating specifically to the contents of the pallet. Warehouses receiving the pallet have RFID tag readers mounted at entrance and exit doors, shipping and receiving docks and storage locations. Software programs record data transmitted from RFID tags and allow warehouse personnel to track the exact location of pallet contents and movement from one location to another. SmartStick™ nailed to pallet Retailers such as Wal-Mart and Target are implementing RFID programs to improve overall customer service and supply chain efficiency. The SmartStick™ meets the needs of these retailer programs for tracking pallet goods inventory levels and movement. Ultimately, the SmartStick™ and total supply chain management programs will provide retailers with better inventory tracking and availability, reduced shrinkage, fewer out of stocks, and lower overall costs for supply chain management. Looking to sell patent outright. This Patent can also be sold with US Patent 6972144. This patent is a recyclable material that can used to construct shipping pallets for the smart stick listed here. 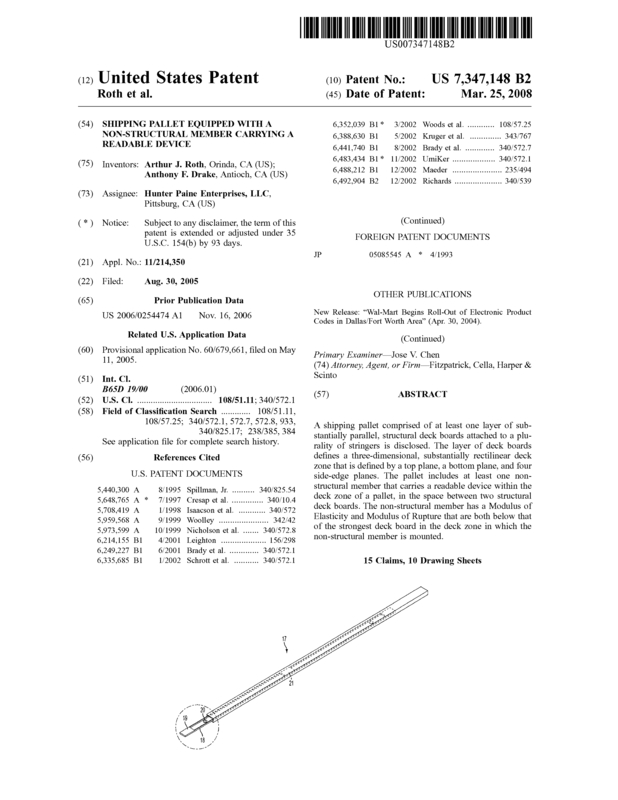 Page created at 2019-04-21 16:42:56, Patent Auction Time.